A fluffy white poodle named Salma survived a near-fatal run-in with a would-be hit and run driver - all thanks to the quick-thinking of a kindhearted cop who put his own safety on the line to help her. Sergeant Fernando Zurita was driving along a busy roadway in the city of Arica, Chile, last week when he noticed a commotion up ahead. Traffic had come to an abrupt standstill, so he leapt from his patrol car to investigate. 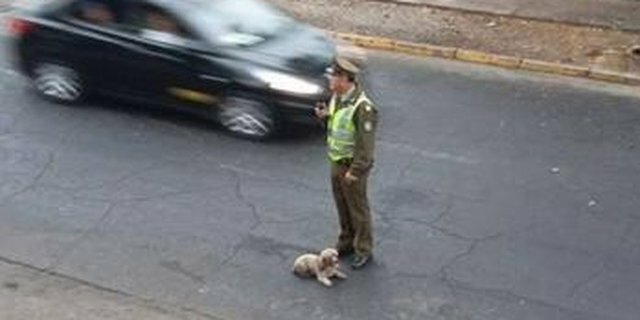 That's when he saw the small dog lying injured in the middle of the street, and the driver of a taxi who had just struck her attempting to flee the scene, reports Soy Chile. Zurita managed to pull the taxi over, after which he stood guard over the dog to prevent other cars from accidentally running over her. A woman nearby captured a photo of the officer risking his life in the middle of the street in order to keep Salma safe. The officer instructed the taxi driver to transport the dog to get medical attention, and then followed him to a veterinary clinic. There, Selma was treated for two broken legs, but is said to be doing well. Her owner, meanwhile, was alerted to what had happened after seeing the photo from the incident on social media, and the pair were soon reunited. She hopes her dog's story, which has since gone viral, will serve as a lesson for others to drive more carefully. For his actions, Zurita is being hailed a hero, both online and among city leaders. This week, he received special recognition from the governor for a job well done.